Jay Z's Budweiser Made in America Festival will be returning to the Benjamin Franklin Parkway once again for it's 4th year this Labor Day Weekend. The show was announced on the festival's website and Facebook page on Tuesday evening. The dates for this year's shows are Saturday and Sunday, September 5th and 6th. No word on a potential lineup yet. There also wasn't any mention of additional cities. 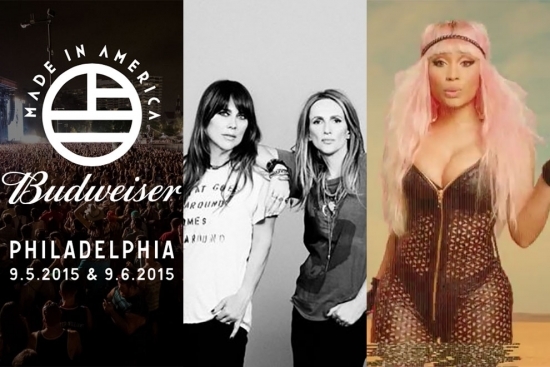 Last year, Made in America was held simultaneously in Philly and Los Angeles. If you are a subscriber to Jay Z's music service you can pre-order 2 passes for the price of 1. 90's Alt-Rock legends Veruca Salt have released two tracks off their upcoming new album Ghost Notes. It's the first album recorded with the original lineup since 1997, and the only new music since 2006. The album is set to come out July 10th on El Camino Records. Veruca Salt is planning on playing a handfuls of live dates across the country in July, though they aren't stopping in Philly. The two tracks are "Laughing In the Sugar Bowl" and "The Gospel According to Saint Me." Listen to them below. David Guetta and Nicki Minaj released the video for their dance track “Hey Mama” ft. Afrojack & Bebe Rexha. The video itself feels like Mad Max meets Burning Man and with a little Coachella throw in for fun. David Guetta commands a band of gypsies that roam the desert stopping to set up dance/rave parties in the sand. Nicki Minaj is a hologram in the sky that sings to these people. It's a loose plot. Check out the video.